Washington, Dec 8 (Just News): Spokesperson of the US department of state Heather Nauert in a press release said thatToday, we commemorate the 30th anniversary of the signing of the Intermediate-Range Nuclear Forces (INF) Treaty between the United States and what was then the Soviet Union. This landmark arms control agreement has been a pillar of international security and stability since its inception. By eliminating an entire class of the most destabilizing weapon systems, the INF Treaty served as a key component to building and reinforcing strategic stability in the later days of the Cold War. It played a key role in securing the Euro-Atlantic region and set in motion the negotiations for a series of agreements to stabilize the post-Cold War relationship between the United States and our allies and the former Soviet Union, she said. Unfortunately, this pivotal agreement is under threat today. The Russian Federation has taken steps to develop, test, and deploy a ground-launched cruise missile system that can fly to ranges prohibited by the INF Treaty. In 2014, the United States declared the Russian Federation in violation of its obligations under the INF Treaty. Despite repeated U.S. efforts to engage the Russian Federation on this issue, Russian officials have so far refused to discuss the violation in any meaningful way or refute the information provided by the United States, she added. 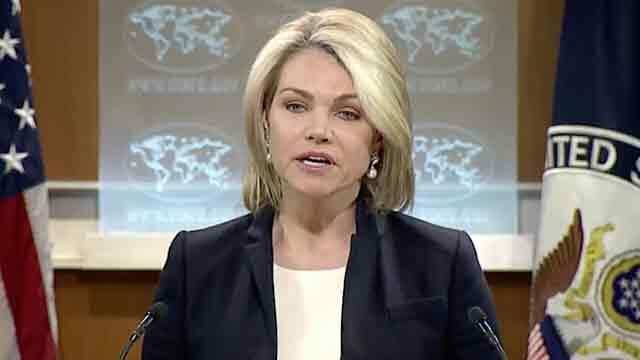 Nauert said the United States remains firmly committed to the INF Treaty and continues to seek the Russian Federation’s return to compliance. The Administration firmly believes, however, that the United States cannot stand still while the Russian Federation continues to develop military systems in violation of the Treaty. While the United States will continue to pursue a diplomatic solution, we are now pursuing economic and military measures intended to induce the Russian Federation to return to compliance. This includes a review of military concepts and options, including options for conventional, ground-launched, intermediate-range missile systems, which would enable the United States to defend ourselves and our allies, should the Russian Federation not return to compliance. This step will not violate our INF Treaty obligations. We are also prepared to cease such research and development activities if the Russian Federation returns to full and verifiable compliance with its INF Treaty obligations. The United States does and will continue to abide by its INF Treaty obligations. We call on the Russian Federation to take concrete steps to return to compliance, preserve the INF Treaty, and restore confidence in the role of arms control to manage strategic stability.